In the world we live in today, virtually everyone you come across possesses a Smartphone which they use to communicate and stay up-to-date with the latest trends in the world. Most of us have become too attached to our smartphones that we can ever do anything without our smartphones. I am sure majority of us are reading this post on our Smartphones. 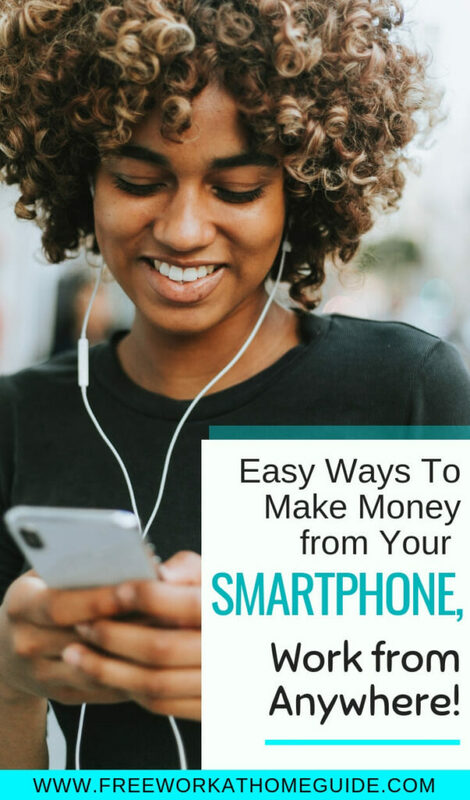 Well, if you do not know this already, let me be the first to point it out to you, it is possible to make money from the comfort of your home or anywhere you find yourself with the aid of your smartphone. Your smartphone is like a mini computer that you can take with you anywhere you go. To make money with this mini-computer, there are certain applications that you can download on your smartphone and then make cool cash while using them. I don’t mean, your regular Whatsapp or Instagram but certain Work from Home applications that you can use to make money from anywhere you are. In this post, I will be showing you a list of applications that you can download on your smartphone to make money this year. The applications listed below have been created to help you make money simply by surfing online or playing games with your Smartphone. Swagbucks: Swagbucks has an application that you can download on your Smartphone. You will be required to complete simple online tasks like taking surveys, watching videos, playing games, or using the search engine feature and after completing each tasks, you will be rewarded with points which you can redeem for cash. Swagbucks is adjudged one of the most popular applications for making money online so you can take advantage of this opportunity by downloading the application today. Pinecone Research: Pinecone Research is another mobile app that you can download to make money. Pinecone pays you cash to complete short surveys, play games, browse the web, and also complete other short tasks. Nielsen Mobile and Computer Panel: Nielsen Mobile and Computer Panel also helps you make money on your smartphone. All you need to do is download the Nielsen Mobile App and then make money simply for having the money installed and running on your phone. Ebates: Ebates gives you cash back for shopping through their mobile application. All you need to do is sign up, shop with your preferred retailers and then get cash back for every purchase you make through the Ebates Application. It is a very good way to make money from your smartphone while you still have time to carry out other activities. TopCashBack: TopCashBack is another very popular shopping website that pays you cashback whenever you shop with your favorite retailers through the application. If you are someone that shops online regularly, then TopCashBack should be installed on your phone because it gives you the opportunity to make money simply by shopping. Ibotta: Ibotta is another very amazing shopping app that pays you cashback anytime you shop. Ibotta mainly focuses on Grocery so if you are someone that grocery shops every day, Ibotta gives you the perfect opportunity to earn actual cash after every shopping experience. So it’s a double win situation for you because not only will you be getting the groceries you need, you will also make extra cash while at it. Decluttr: If you have used DVDS, books, and other used appliances and you are looking for a place to sell all these items, download Decluttr app on your phone and start making money easily. All you need to do is scan the barcode of the items you want to place on sale, confirm the selling price, and then wait to be connected to anyone interested in purchasing what you have on sale. Great way to make money if you ask me. Poshmark: Do you have used clothes gathering dusts in your basement? Well, you can make money selling them out on the Poshmark mobile application. All you need to do is take a picture of the clothing item, upload on the app, and then wait to be connected to a potential buyer. Very easy!!! Now that you know how to make money with your Smartphone, you do not need to wait any longer. Head over to your application store and download these apps today.